The H.E.S.S. telescopes have surveyed the Milky Way for the past 15 years searching for sources of gamma radiation. The H.E.S.S. collaboration includes scientists of the Institute of Astronomy and Astrophysics of the University of Tübingen led by Professor Andrea Santangelo and Dr. Gerd Pühlhofer. They are interested in sources of very high energy gamma radiation in the TeV energy range, i.e. in the range of 1012 electron volts, corresponding to a trillion of the energy of visible light photons. For the first time they have been able to classify celestial objects using only the emission of this kind of radiation: very likely they are supernova remnants, which are celestial objects that emerge after the explosion of massive stars. The results are published in a special edition of the scientific journal Astronomy & Astrophysics, which appears on the occasion of the 15th anniversary of the H.E.S.S. telescopes with the largest set of science results of the project to date. Over 200 sources of TeV radiation are known to date, both Galactic and Extragalactic. “We can often relate the radiation to known astrophysical objects that have been studied before with conventional telescopes in lower frequency bands, e.g. in optical or radio wavebands”, says Gerd Pühlhofer. Positions of the newly detected supernova remnant candidates, emitting TeV radiation (shown in the bottom panels), on the H.E.S.S. Galactic plane survey map (shown at the center of the top panel). The H.E.S.S. 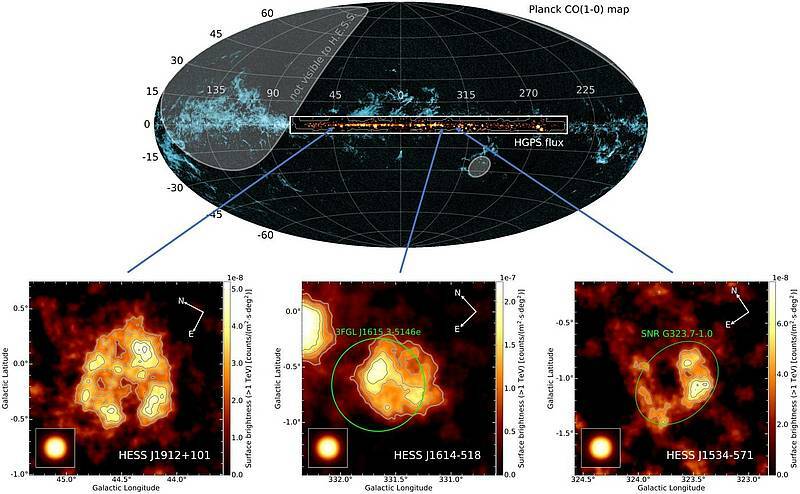 survey map is overlaid on a molecular gas all-sky map from the Planck satellite. Image credit: H.E.S.S. collaboration. A supernova remnant is a celestial object that forms after the explosion of a massive star at the end of its lifetime. The matter that is expelled in such an explosion leads to shock waves that propagate into the interstellar medium. There, the matter is heated and particles are accelerated to relativistic speeds. The particles interact with light and gas in the neighbourhood of the sources and thus produce very high energy gamma rays. “We have already known since well over a decade that some of the 300 known supernova remnants in our Galaxy shine brightly in TeV gamma-rays”, explains Daniel Gottschall, PhD student in Pühlhofer’s research group. “But all these objects have been known before from observations in other wavebands and have been classified as supernova remnants”, adds Massimo Capasso, also PhD student in the research group. The question remains, states Gerd Pühlhofer, why these supernova remnants have escaped detection so far. “They are as large as the full moon, but totally invisible to the eye or to conventional, e.g. optical, telescopes”, explains the astrophysicist. He considers it possible that in previous sky surveys, because of their position in the Milky Way and because of their large extension, they were indistinguishable from the many other objects or they are partially covered by foreground gas. The community of gamma-ray astronomers is currently preparing the much more sensitive next-generation instrument for TeV gamma-ray astronomy, the Cherenkov Telescope Array CTA. Scheduled to move into regular operations in the 2020’s, it will provide a much more detailed and sensitive image of our Milky Way in gamma-rays. Citation: A search for new supernova remnant shells in the Galactic plane with H.E.S.S. Corresponding authors: G. Pühlhofer, D. Gottschall, M. Capasso.